But many investors have now started to question the value of investing in ETFs versus individual stocks. An ETF is a listed managed fund that trades on the stock exchange just like individual stocks. 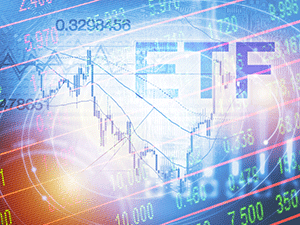 ETFs provide investors with access to different asset classes such as stocks, commodities, bonds, debt or currencies. Similar to an unlisted managed fund, an equity ETF, for example, can be exposed to up to 200 shares or more, which endeavours to replicate the performance of a specific index or benchmark, such as the S&P/ASX 200 index. Although, depending on the asset class, ETFs may benchmark a currency such as the US dollar or a commodity such as gold. A major consideration for most investors when investing in the stock market is the associated costs of the investment. 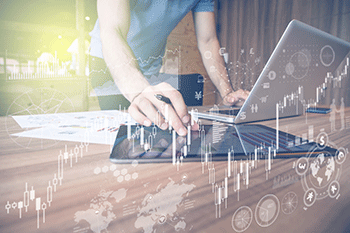 Consequently, one of the so-called benefits of investing in an ETF is that it provides investors with access to the market at a lower cost than many traditional managed funds. ETFs are also priced more efficiently to the value of the assets in the fund, as they typically operate with an arbitrage mechanism that assists in keeping the share price in line with the value of the underlying assets. While these attributes make ETFs an attractive proposition, investors are still exposed to the same risks that lead them to jump ship from managed funds during and after the GFC. That’s because investors are still subjected to the fluctuations of the market given that ETFs have to remain fully invested regardless of whether the market is rising or falling. And while some would argue that an investor can sell out of an ETF at any time, the unfortunate reality is that most don’t sell assets that are falling in value for fear of losing out. Remember, the goal of an ETF is to track an index or benchmark, but similar to the issue with unlisted managed funds, many investors are paying for the privilege of achieving average to below average returns. Let’s look at an example. 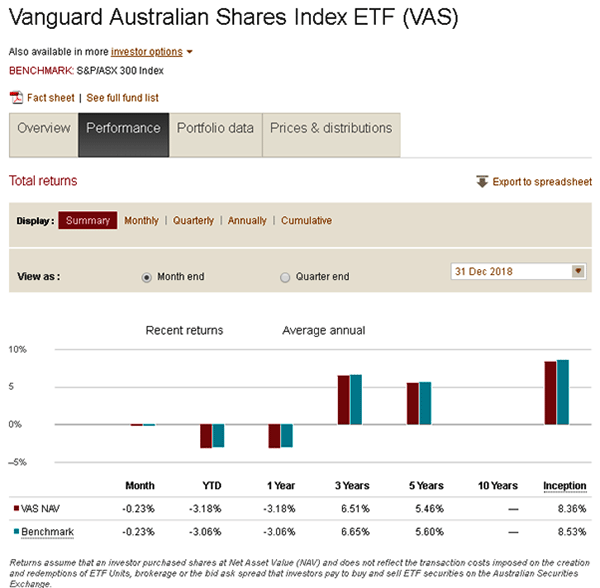 If we review the Vanguard Australian Shares Index ETF (VAS), which is one of the largest ETFs in Australia, you will notice that it has underperformed the S&P/ASX 300 Index, which is the benchmark for this fund, since inception after management fees. And if you take a closer look at their disclosure, these returns do not reflect the transaction costs imposed on the creation and redemption of the ETF units, brokerage or the bid ask spread that investors pay to buy and sell ETF securities on the ASX. So what does this really mean? If these costs were factored in, the returns would be lower than what is actually presented. For those of you who follow my philosophies, you will know that I favour investing in individual stocks but only if you are prepared to gain, at least, some knowledge to protect your investments. That’s because the number one reason why the majority of traders and investors fail in the stock market is due to a lack of knowledge about how the market works and how to manage investment risk. In fact, I trade a portfolio of the top 20 stocks on the ASX over a 10 year period from 2 January 2007, to take into account the effect of the GFC, through to 31 December 2016. And I do this using some very simple trading techniques, such as a trend line and stop loss. Some of you may be surprised to learn that the gain achieved from capital growth and dividends was 225.82 per cent or an average annual return of 22.58 per cent over the ten-year period. This equates to an annual compounded rate of return of 12.54 per cent.